The extraordinary La Pietra property incorporates several amenities and features that can enhance the health and well-being of its occupants. What can be more important than that when deciding on what kind of home to buy? MacArthur Sotheby’s International Realty, a luxury real estate firm based on the Big Island of Hawaii, is pleased to announce the first Delos Wellness Signature™ residence in Hawaii is on the market for sale. Doreen Trudeau, R(S) of MacArthur Sotheby’s International Realty is working together with listing agent Kelly Allen, R(S) of Carvill Sotheby’s International Realty located on Oahu, to market the only Delos Wellness Signature™ residence in the state, located at 3084 La Pietra in Honolulu. A Delos Wellness Signature™ residence is designed and engineered to enhance both emotional and physical health and well-being by including the best concepts of green technology. Informed by seven years of research and rigorous analysis of environmental health impacts on people, Delos has fostered research collaborations with the Cleveland Clinic, Mayo Clinic, a board of doctors from the Columbia University Medical Center and leading architects, scientists, and wellness thought leaders to introduce wellness standards, programs, and develop integrated solutions that address human sustainability into the build environment. Advisory Board members include Deepak Chopra and Leonardo DiCaprio. “The La Pietra property is a beautiful marriage between old Hawaii and the new, cutting-edge wellness platform,” said Doreen. Interiors by award-winning designer Chuen Yee, 3084 La Pietra showcases a living plant wall and understated finishes creating a relaxed environment enhanced by the circadian rhythm lighting and built-in aromatherapy system. The La Pietra townhome renovation also boasts cutting-edge wellness features including a stand-alone air purification system, energizing light, whole home water filtration, and a reflexology shower floor. This residence is in the exclusive gated community of La Pietra on the slopes of Diamond Head, and offered at $2,599,000. “Given that Hawaii repeatedly ranks as one of the healthiest places to live, we anticipate quite a bit of interest,” said Kelly. “It is exciting or us to partner with Kelly Allen to sell this special Wellness Signature™ property. 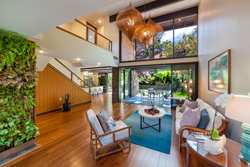 It’s a reflection of our reputation serving distinctive clients in Hawaii for many decades with a focus on excellent service,” said Dodie MacArthur, CEO and Owner of MacArthur Sotheby’s International Realty. For more information about the La Pietra Honolulu property, please contact Doreen Trudeau, R(S), here. MacArthur Sotheby’s International Realty, which has offices in Kona and Kamuela/Waimea, Hawaii, has served the Big Island of Hawaii as a boutique luxury real estate company offering the best in customer service for distinctive clients for over 26 years. MacArthur Sotheby’s International Realty offers exclusive Sotheby’s International Realty marketing, advertising and referral services designed to attract well-qualified buyers to the firm’s property listings. The Sotheby’s International Realty network currently has over 21,000 affiliated independent sales associates located in over 900 offices in 68 countries and territories worldwide. In 2016, the brand achieved a record global sales volume of $95 billion USD. Each office is independently owned and operated. Property listings are marketed on the Sothebysrealty.com global website, as well as on the firm’s local website, http://www.BigIslandRealE.com.